“Way to get out there!” my watch gleefully announces. I watch its face, awaiting any further messages from its GPS ROM that has tracked my every move for months. In any other circumstances that might be a disturbing thought, but here the watch and its sister satellite high above my head record my movements like the Goddess Nike made flesh. Nope, nothing else, not today. I was hoping for a “crowd goes wild”, which means a personal best, or “great finish” which means that the last km was the fastest. I stop looking at it and enter my house. Running is a funny business. It is the most simple and easy of sports to take up; all you need is a pair of shoes (and these days there is a whole barefoot running clique who claim you don’t need even those) and yet, and yet, never in my life have I run more than 100 meters. Not that I was shy of sports; fencing, martial arts, marital arts – you name it. However, my first day’s attempt to run down to the gym was a disaster once those 100 had passed. My body simply stopped me flat and demanded to know what I thought I was doing, was I being chased by a hungry lion? Or avoiding an imminent meteor strike? No? Then why the hell are you doing this to us? It asked, gasping. In the past such stern questioning, not to mention the following sensation of aching lungs, were enough to stop me. But, not today because I had caught a bug. I have always been a fan of the colourful US brand. When I was a child, Nike was the coolest thing in the world; both ridiculously expensive and stylish. Unobtainable. Since then they have gone through a bit of a sea change themselves, upping the quality levels, creating some great equipment and yet keeping that cool label, that newness. Even when they come late to the party and a little underpowered in the features department even then they make a splash with their style and their enthusiasm. It is that enthusiasm that is the key feature of this watch. “Good morning, sir,” said the thin and fit looking shop girl from behind her achingly cool piercings. I guess I did look like a fish a bit out of water, in a running shop at this time in the morning; she looked like a 20 mile run was a daily occurrence before breakfast. Dressed for work, I guess I have the look of a geek with a love of good quality gadgets. “I’m looking for a running watch with a heart strap,” I said. “The Garmin” she said, pointing into a small glass fronted cabinet next to me. I looked at the watch in question; it was a phenomenally ugly and boxy device like one of those stop-watches PE teachers carry that had been welded to a watch strap. Next to it stood the Nike GPS. To say that the Nike looked better is an understatement. I realised that I could wear that watch all day, even at work. “The Nike’s nice,” I said hopefully. The girl gave me an appraising look, followed by a pause as she mentally switched records in her head. Even I know that’s code for, “she wouldn’t be seen dead in one”. However, Given that she has trouble walking through metal detectors or passing large magnets, I wasn’t swayed by the opinion her expression was trying oh so hard to hide. I realised that I was entering a new world with two groups, the sort of people who run every day for miles and miles and miles, and the sort of people who run a couple of times a week for around 30k total. The élite and the, well, not so élite. “how much is the Garmin?” I asked. “£350” she answered, clearly of the opinion that mere price was an irrelevant point. I looked again at the choice. There was nothing more to say. If I turned up at home with a £350 watch I would be strung up by Cesca and rightly so. I did a mental calculation in my head as I was going to have to sell a beloved Christopher Ward watch to pay for it. Apple has indelibly changed the definition of what is cool in packaging when it released the iPhone. Since then many manufacturers have copied their approach. For example, my Samsung phone came in a box almost identical to the iPhone (and the phone is so similar that Apple is suing). Nike, who is surely BFF with Apple, has also followed Apple’s philosophy. The box containing the Nike watch is small and very well designed while at the same time evoking the spirit of the sort of boxes high-end watches come in. Everything is compactly slotted in. Compared to the competitions simple blister packs this speaks volumes. Once its secrets are open the following items are found within. Another thing Nike has learned from Apple is to have no truck with anything but complete brand loyalty in a passive aggressive way. This is displayed perfectly with the lack of any way to attach the Shoe Pod to anything but a Nike shoe (which has a special hole for the nugget like device in the sole). I would have despaired had I not expected it and ordered a small pouch from amazon that attached to my laces. This little fella is cleverly designed and extremely snug – so it holds the Pod perfectly. I followed the simple instructions and charged the watch up while signing up to download the sync software from Nike’s web site. (We will come to the website in-depth in a moment). The watch has a thin USB adaptor hidden under the flap at the end of the strap. This clicks open and can go straight into a computer USB socket or via the short and branded extension cable given away in the box (presumably since some people still have under desk computers and not laptops). Once socketed the watch displays a charging message. One of the most interesting features of this watch is its display. The LCD is in negative mode meaning that the screen is dark and the numbers and lettering are in blocks of “turned off” colour. It has a large-size font choice meaning that the time display is split over two lines, which looks great and a close-up of the LCD shows it to be of very high “resolution”, the fonts curving smoothly and not blocky at all. There is no doubt that this display could show graphics with ease if it wanted to. The boldness of that display puts it firmly in the extroverted cool realm and the bright yellow on the reverse of the band (visible only in flashes and glimpses when on the wrist) follows this. Next to the time, at a 90 degree angle, sits the day and date information along with the battery meter. This is the battery meter for the running part of the watch not the clock part. Once charged, which took about an hour (so it must be part-charged out of the box) the watch is ready to go. An “up down” rocker is on the left hand side above a bright yellow button. The rocker moves the watch through its menu system and the yellow button acts as an “enter” selector. “Clock” This returns you to the clock mode. “Run” Start a new activity. “History” The last 50 activities. Notice there are no settings to be configured. Rather all the settings, apart from the registering of new sensors, is performed in the computer software upon attaching the watch via USB. This configuration software enables you to change lots of features, such as the default screen display while running; settings for laps, whether the watch will bug you to go for a run or even what your weight is for the calorie calculations. On the wrist the watch stands quite tall and with its nice curved glass screen is just waiting to get smashed. Never the less I wear it every day. It goes well with my work clothes in that it is in a way a totem. Wearing a running watch to work, especially this running watch, is making a statement. That statement says that you are a member of the “club”. Not a geek member totally obsessed with statistics; no you are a “cool” member. This is a watch design for enthusiasts to meet other enthusiasts. I get a lot of interested questions regarding it, as many as I got for my other watches and this is all to the good as it provides motivation. Balancing the design of something is nearly as hard as wearing it if it makes a statement. All too often that statement is perhaps not the one intended. Consider the 50+ guy with his Jag car, or oversized Tag watch. Most of the time such a person’s statement is “I’m a berk with too much money and a lack of inner success”. This watch simply sidesteps that. Anyone who challenges your “right” to wear it can be simply provided with the “Records” section to check your bonafides in seconds. As long as you have them that is. When all is said and done, you must run the miles yourself; the watch will not do that for you! It is not heavy at all and doesn’t bother me on the wrist. One thing to note is that the strap is integrated and therefore cannot be changed in any way. This may not be an issue unless the watch doesn’t fit. I have heard of people with very small wrists not managing to get the watch flush to their skin. For me, I run the risk of the opposite problem; my wrists are too big! I have the watch on the largest setting and it is snug and not loose. Of course having a watch this tight sometime means I can accidentally press a button. This has only happened in the gym once when lifting a 55kg bar weight above my head; my hand was pushed back enough that the back of it pushed a button. After stopping and pulling the watch up my arm the problem was solved. The first thing one has to do when running for the first time is pair the sensors with the watch. I have the heart belt and shoe pod and I found that on first attempt at pairing (standing in the gym) the watch picked up too many sensors in range. Standing, briefly, outside solved this issue and I have not had it happen again as the watch remembers the pods, etc. it knows. When deciding to do some recorded exercise you select the “run” menu and then turn on or off the sensors. So, if you are working out in the gym on weights, you turn off all but the heart rate belt and it will record your time, heart and calories. On the other hand, running outside (the watch’s primary use) will involve all the sensors and after turning their options to on, and selecting “continue”, the watch will announce that it is “linking sensors”. If you have wetted the Heart belt and moved the shoe pod within the last minute then it will pick these up in a few seconds. However, I have had the GPS take up to a minute (which feels longer when you are staring at the screen). Nike claim that the watch gets better at pinpointing the satellites in each use, and indeed I have seen the text “Updating satellite data” in the computer GUI as I sync it with Nike website. However, the watch also features the ability to start your run before the satellite has a fix, known as “quickstart”. This option is clearly there because the GPS lock takes so long (sometimes!). Of course, you wait. Eventually the link works and you get a little set of beeps that you are ready to go. A touch of the “start” menu option and you can head off! Not a touch of the screen mind, you have to tap the top of the case front. Coincidentally, tapping this while in “clock” mode turns on the backlight for a brief moment. You can also have intervals as programmed again by the computer GUI. This means your speed work training will benefit from the watch telling you the splits and assisting you in not cheating. Using the up and down rocker buttons you can switch the upper part of the screens display to show various metrics such as km, time, km average, heart rate, etc. All are easy to read when on the move. Tapping the yellow button pauses the action, something I use only when crossing a busy road or my phone rings or I come across a giant queen bumble bee (all of which has happened on my runs). Once you have finished your run, the watch displays a little congratulations message dependent on your performance and plays a little tune on a personal best time. This is very cute in action and I find myself quite looking forwards to it. Then the watch displays the stats for the run all on one screen. 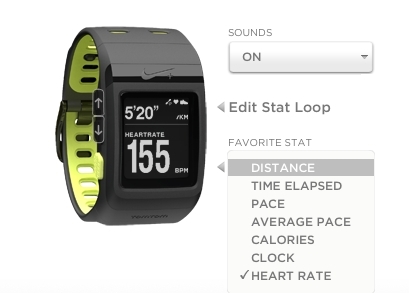 You can also use the watch to only record workouts on the HRM. In this mode the watch turns off the GPS and foot pod. I use the watch in like this every other day and it performs its functions well. The BPM is the useful metric when lifting as it enables you to properly manage your between sets and recovery times. So, while the watch doesn’t offer and specialist mode for lifting, it is just as good as any other HRM. On the elliptical and other machines the HRM is often compatible and the machine will show that rate rather than that of the “grip” sensors. I often note that the watch is one or two calories different from the elliptical machine, something that is probably to do with the method of calculation. 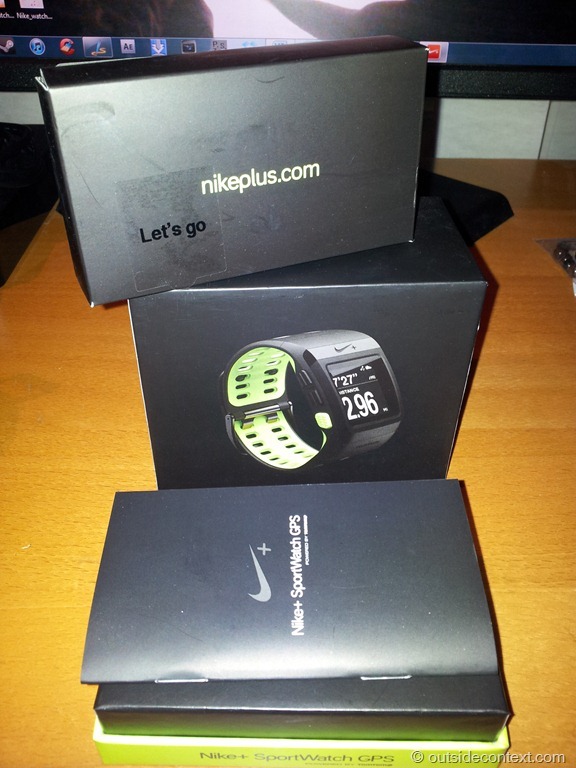 The Nike watch is designed to synchronise with the Nike Running website and is one of the largest features of the system. Upon placing the watch in the USB it uploads to Nike and then boots their website. Nike present a very high end website built in flash. However, the flash programming is terrible. The problems plaguing the Nike website have all been totally fixed. The site is now HTML and very slick. Basically, it is fixed. The following issue report is for reference only. Parts crossed out no longer apply. I often find that the flash fails to load in sections of the site. For example, I have logged in to the “home” screen and selected “goals”. Blank. Nadda. So I select “home”. Now that’s blank. So I log out and back in. Now my profile is missing. So I select “all runs”. Blank. 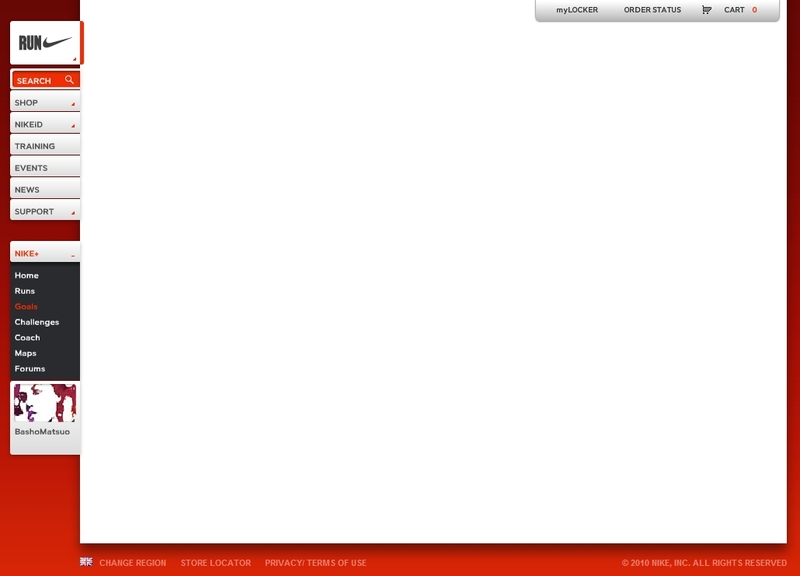 This isn’t my version of flash or my browser choice; this is simply a bad website. The choice of flash is bizarre, as Apple mobile devices cannot display flash and so you have the situation where your iPhone can upload a run, but can’t show the run in Safari mobile. It’s not as if Nike can’t program great websites. Consider this one, which invented a completely new method of coding using parallax techniques and is written in fantastically quick and smooth HTML5. Some of the features provided in the website are excellent. There is the runs themselves and each will show a map of the distance covered on a mapping system. 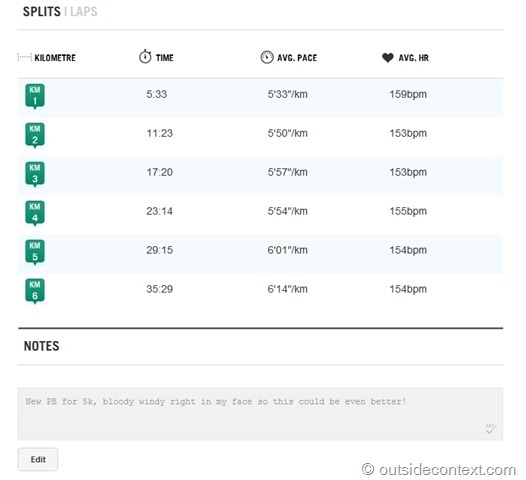 This system is improving all the time and now you can use it to plan a run as well as review one. This is very helpful if you need to find a 5 or 10km route around your town. Also great is the “goals” section that assists you in tracking progress. I find that having a goal that is within a few weeks’ reach is much more motivating than the long term goal of “getting fit”. Humans as a species tend to be terrible in focussing on longer term goals compared with immediate sensations (hunger for example). 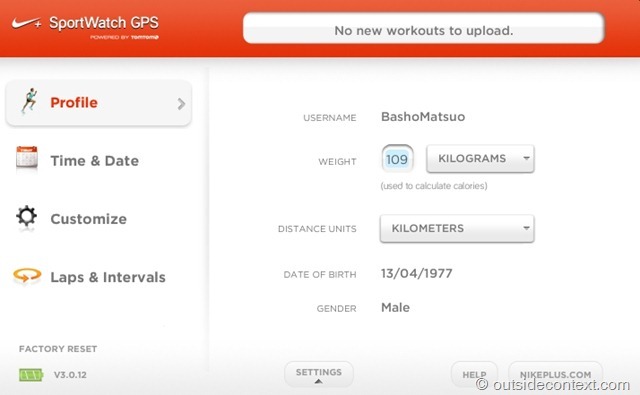 When you upload runs (and only runs – it doesn’t count workouts) they are automatically counted towards your targets. I have found that this has motivated me much better than I thought it would. It is the feature I love the most. Above all this there are also “challenges”, which are like goals mixed with online clubs. Anyone can create a challenge and have people sign up to join you in it. Some are silly, some are charity based, some are mega hard and the website helps filter them based on your “Nike Level”. This simple metric grades your progress as a runner using colours. Upon going up a level you get a small movie of some runner congratulating you and a new set of challenges to run against. It’s clever and motivational. I am now half way to the third category and I find myself considering running more often to speed up my progress. That’s a great design influencing my motivation. Nike certainly has that aspect of the experience nailed. The site also links in to Facebook and Twitter and when you upload a run it posts it to the social networks as well as when you set a new goal. This enables your friends to comment on it and motivate you even more. I have even found that friends have read my constant Facebook posts and taken up gym’ing themselves. However, for some stupid reason the system only posts your last run, so if you upload them in batches like me (as I run to the gym, gym, and run back) then the others are not Facebooked. This is slightly annoying as the final run of my routine is always the slowest as I am tired from lifting. Are there any other problems with the watch and experience? Nikes forums are full of people complaining about problems with their watches. The main one seems to be that the GPS is not super accurate. I have not found this myself. 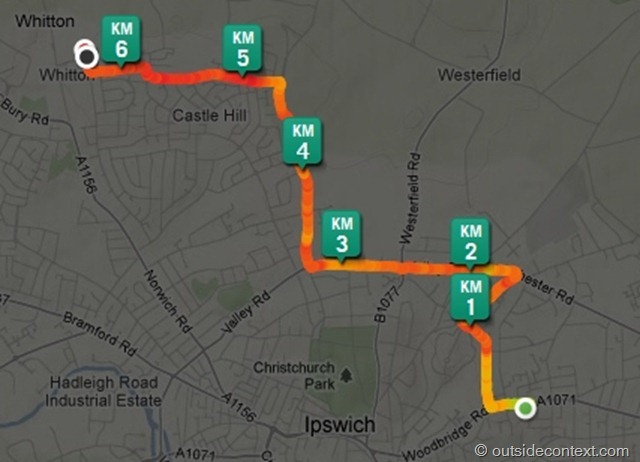 Reviewing my runs on the maps shows that the system has correctly picked up my journey. Perhaps it is to do with the satellites overhead? Others have complained that the website doesn’t show enough detail of the runs for post analysis. I think this is an issue for those in the “elite” group. Nike hasn’t got all the detail recorded in the run on the site, but I understand they are considering it. Recently I received a questionnaire about the Nike site and it asked my preference for detail. I said that I always wanted as a much as possible. Hopefully they are listening to the criticisms of those shouting. As is often the case on the web, the loud, angry minority make much more noise than those happy with their product and experience. I personally am very happy with the watch itself and unhappy with the website. However, I am content to give Nike a chance to repair or replace the online portion of the system. Such an action would not hurt their brand in the slightest, as flash is dead. No one in their right mind programs flash anymore and to block out Apple device users is a stupid direction given their popularity. GPS by TomTom + Shoe Sensor: GPS functions in tandem with the Nike+ Sensor to optimize seamless data tracking during runs (e.g. when running through an urban canyon, where GPS connection may not be available). Tap Interface: Users simply tap the display to activate the backlight and to mark laps during their run. Direct Connect: USB contacts are molded into the watch strap allowing the user to plug the watch directly into a USB port to upload run data and recharge the battery. Run Reminders: Users get automatic reminders from the watch when a run has not been logged in the past five days. Attaboys: Users receive recognition for achieving personal records, such as fastest mile, longest run, fastest 10K and fastest marathon. Nikeplus.com: Run data is saved to Nikeplus.com where runners can map their runs, find new routes, track their goals, receive coaching tips, challenge their friends, share their progress through Facebook and Twitter and more. Problems with Nike Running Website – Flash (yuk!) **UPDATE** Fixed! For its motivational components, great design, high end experience I give the watch an 9/10. It is a simple and well-made device that I have a great affinity for. I am wearing it now on the train into London. For the online portion of the experience I can only award Nike 7/10 with a note that when the site works well its potential is manifest. However, this is not all the time and so they “must try harder”!